Please note that the content of this book primarily consists of articles available from Wikipedia or other free sources online. Popeye the Sailor: 1933-1938, Volume 1 is the first authorized collection of theatrical Popeye cartoons on home video. 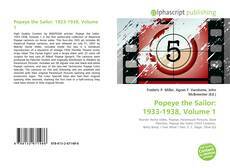 This four-disc DVD set includes 60 theatrical Popeye cartoons, and was released on July 31, 2007 by Warner Home Video. Included inside this box is a miniature reproduction of a sequence of vintage 1936 Thimble Theatre comic strips titled "The S'prise Fight!" and a recipe sheet with 25 cents off coupon for two cans of Allens' Popeye Spinach. The cartoons were produced by Fleischer Studios and originally distributed to theaters by Paramount Pictures. Included are 58 regular one-reel black-and-white Popeye cartoons, and two of the two-reel Technicolor Popeye Color Specials: The cartoons on this and following sets are unedited and restored with their original Paramount Pictures opening and closing production logos. The Color Specials have also had their original opening titles restored, marking the first time in a half-century they have been shown in their original format.